OnePlus 3 launched with flagship specs and price. Stay tuned for a hand's on , Subscribe here - Subscribe. 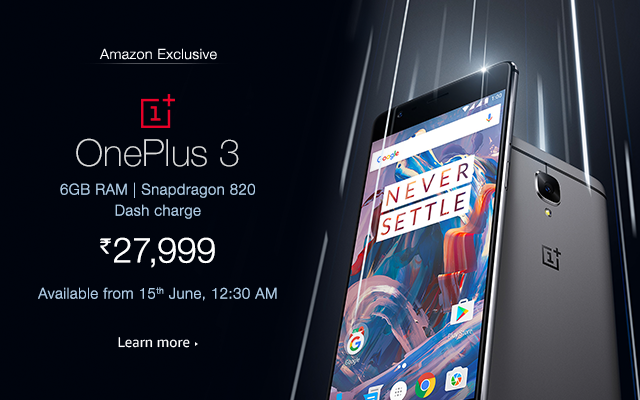 OnePlus 3 is priced at INR 27,999 (around $419) and will be available from 15th June 12:30AM. Well won't complain about the spec and won't appriciate it until and unless we see it in performance. OnePlus has gone with a flagship spec this time too for OnePlus 3. Let's have a look. OnePlus 3 sports 5.5-inch Optic AMOLED display and runs Oxygen OS based on Android Marshmallow 6.1.0 . It is powered by Qualcomm Snapdragon 820 processor and Adreno 530 GPU. It will pack 64GB internal memory with 6GB of RAM. It will features 16MP rear camera that comes equipped with a shutter and lighting-fast speed, autofocus, a unique noise reduction technology for better pictures as well as supporting stabilizing methods for shake and movement free images, 8MP front camera. The OnePlus 3 supports dual-nano SIM and fast charging which OnePlus calls as Dash Charge Technology which ensures phone is charged really fast. This Unique Dash Charge technology doesn't let your phone overheat with help of Dash Charge Adapter. So what do you think about the device? Still official launch is on it's way, We are excited, are you?